Volume discounts are very common in B2B situations. Businesses tend to order the same products over and over again. Large volume purchases are great for business, but often this includes an expectation that you will offer a volume discount. If you are in this situation, you can Increase profits on volume discounts with this simple pricing trick. Recently, I have seen several volume discount negotiations that didn’t use this pricing method. Including this method resulted in more than a 15% improvement in profits, just on one deal. When pricing large volume deals, you should use tiered pricing instead of volume pricing. Before I dive headfirst into volume discounts, make sure you actually need to offer discounts to be competitive. Walk through the Competitive Differentiation Framework and the Ultimate Pricing Roadmap before you decide if you really need to offer a volume discount. Just because someone asks, doesn’t mean you have to give. Discounts can be part of Cost-Plus Pricing, Market-Based Pricing, or Differential Pricing Strategy. Volume discounts mark down the price of every unit sold once a threshold has been met. Tiered discounts only apply to the units sold after a threshold has been met. That means the first unit is sold at full price and you honor the volume after real purchases have been made in a given period of time. Pure volume discounts lower the price of the first unit sold after it was already sold. In many cases, this means you actually have to give back some of the money already earned. Let’s not do that. Figure 1 illustrates how this happens. If your customer sees that 11 units actually cost less total money than 9 units, of course, they’ll take it. Unfortunately, you just paid your customer to take 2 units off your hands. And now the customer has a surplus so they’re not going to order in the first week of next month. Oops! You just shot yourself in the foot with volume discounts. Figure 1. 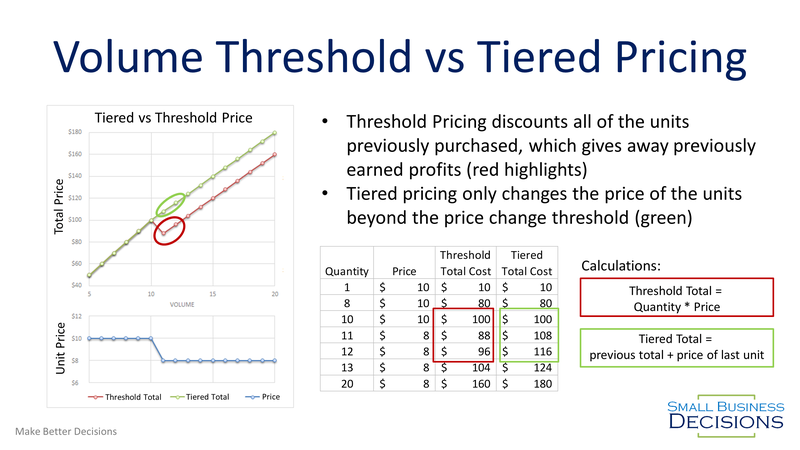 Tiered Pricing vs Volume Threshold Pricing scenarios. This illustrates the difference in total profit for one method vs the other at various actual volumes. When pricing large deals, the volume discount discussion always seems to focus on the price of the last unit in the deal. The negotiations start with a buyer giving you an estimated volume and asking for a discount based on his estimate. Unfortunately, those volumes are quite often overstated, whether on purpose or by accident. One great purchasing tactic is to overestimate volumes in order to negotiate a lower price for all units. Then get into negotiating minimum purchase volumes that are lower than the original volume estimate. In reality, the discount threshold is the contracted minimum volume, not the volume estimate. So, psychologically the buyer convinced you to set a low volume threshold and then discount your price based on a higher number than he is obligated to meet. With Tiered pricing, you no longer have to negotiate contracted minimum orders. Contract minimums sound great, but enforcing any fines associated with not meeting those orders gets really difficult, uncomfortable and potentially costly. In reality, if a business does not meet its contracted minimums, they are probably not making money and are most likely in financial trouble. They won’t have any money for you to go after in the first place. All of that could be avoided if you use Tiered Pricing. One issue I have seen is that at times, someone can offer such a steep discount that each new unit beyond a certain volume is sold below the marginal cost of producing that unit. In this case, you are likely on your way to bankruptcy and no amount of volume is going to make up for losing money on every sale. This is one time that Cost-Plus pricing is crucial. There are many ways to calculate tiered discounts, but here are a few of the easiest ways. We made a tool for subscribers. So it’s easier. You can subscribe and have access to the tool by clicking on the download link. This is fairly easy to do in excel for smaller quantities, but you need to have each unit in a row. Calculate the price of each unit and add them all up. Or, create a cumulative column which adds the price of the current unit to the total cumulative cost of the previous unit. Here’s a quick hack for some very complicated tier systems. You can calculate the total cost of all the units in a tier by multiplying the number of units in the tier by the price. If you know the total cost of each tier, it’s easier to add up those buckets than doing each unit cumulatively (like the first method). On your price sheet, have the cost per unit, the cost per tier, and the cumulative cost of each tier plus previous tiers. Then you can quickly multiply the number of units in the current tier and add them to the cumulative cost of the previous tiers. For example: If you have 3 tiers, the first 100 units is $10, the second 100 units is $8, and anything after that is $7. The cost of all units in the first tier is $1,000. The cost of all units in the second tier is $800, so the cumulative cost of the first two tiers is $1,800. If you sold 250 units, you would calculate that the 50 units in the last tier was $350 and add that to the $1,800 pre-calculated cost of the first two tiers for a total of $2,150. This way isn’t necessarily the easiest to calculate, but if you need to think of things in terms of discounts per tier, this way will work. Multiply number of units with the undiscounted price, then add in the discounts for each tier that the customer qualifies for. When you offer volume discounts, it is always a good idea to highlight the original full price and show that you are giving the customer a discount. This simple act of making it clear they are getting a discount has a positive psychological benefit for the customer. If you have customers that start to try and negotiate a volume threshold price instead of using tiered pricing, just tell them it’s not in your policy due to risk and complexity of unproven volumes. Or, say you’ll consider negotiating on those terms after they have actually hit the threshold they’re talking about with this as your first setup. My wife and i felt really joyous when Chris managed to complete his analysis through the ideas he came across using your blog. It’s not at all simplistic to just find yourself releasing techniques which usually a number of people might have been trying to sell. And we also fully understand we now have you to thank for that. Most of the explanations you made, the easy web site navigation, the relationships your site make it easier to create – it is everything astonishing, and it’s really leading our son in addition to our family recognize that this content is enjoyable, and that is seriously vital. Many thanks for the whole lot! Have you ever thought about adding a little bit more than just your articles? I mean, what you say is valuable and everything. But think of if you added some great pictures or video clips to give your posts more, “pop”! Your content is excellent but with images and videos, this website could certainly be one of the most beneficial in its niche. Very good blog!